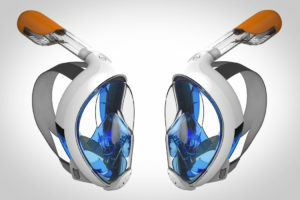 Probably, the snorkeling mask Easybreath is one of the biggest innovations of the last years in the world of snorkeling. He has everything for this consideration, since he has managed to bring many people this wonderful activity, by simplifying and improving the user experience. Its simplicity and accessibility make it ideal for the little ones in the house, as well as for all those who want to enjoy snorkeling without too many complications. What is the Easybreath diving mask? On the one hand, the structure covers the entire face, not only the part between the nose and the eyes, which makes it much more comfortable to feel no pressure on the nasal cartilage, and allows greater vision, having much further the structure and have more glass surface. This type of masks is usually referred to commercially as of "180º vision", because of its wide visual field. On the other hand, the breathing tube is incorporated into the structure itself, which eliminates an additional element. Its placement is very studied so that the angle always lies on the surface; The system of return of the air that we exhale is produced through the structure of the mask, which prevents that it favors the circulation of the air, preventing that it is vitiated, and minimizes the vapor effect in the crystal. It also has an ingenious valve system in the termination of the tube, which prevents the entry of water, which ensures its tightness. With this kind of mask, it is no longer necessary to hold the tube with the lips or the teeth. The breath is exactly the same as outside the water; allows breathing through the nose or through the mouth indistinctly, which avoids the bad feeling that some may suffer when breathing only through the mouth. But not everything are advantages. The great disadvantage is that it does not allow small dives in freediving more than one meter deep. If you want to explore some cavity or get closer to some fish at a shallow depth, forget about trying it when you use the Easybreath mask. The purpose is diving on the surface, and only on the surface. The increase in the cavity between mask and face, makes all that air begin to compress as soon as we submerge. The same thing happens with other types of masks, but unlike conventional ones, in the Easybreath it will cost much more to compensate all that volume. And if it is going to be more difficult to compensate for the air inside the structure, imagine the air in our nasal cavities, since we will not be able to pinch our nose to do the Valsava maneuver for ear compensation, with the risk that this entails. Another great advantage of this kind of mask is the variety of accessories it has. We highlight the one that allows the possibility of anchoring an action camera in the structure, to immortalize our experiences without needing to focus. The camera will go where our eyes point. Maintenance is not complicated; Simply, we should wash our mask with fresh water after each use, and store it correctly. Many of the options available in the market are sold with their own bags to store them correctly during periods of non-use. Today we have many options to acquire an Easybreath type diving mask. Of course, we have the option of Decathlon, although we have other options of specialized brands in this type of product. In this case, through Subea, we have many colors and sizes; always at a reasonable price, and physical and online store availability. If you prefer Amazon, you're in luck. There are several options at good prices; some of them with various built-in accessories, such as ear plugs, or brackets for action cameras. So you already know; If you are looking for a simple non-intensive mask, but that makes you enjoy snorkeling during your family trips, this type of mask can be an interesting option. Diving computers What options do we have? Este sitio web utiliza cookies para mejorar su experiencia. En cumplimento de la ley de protección de datos deberá aceptar el uso de cookies y nuestra política de privacidad para continuar navegando.